Organisation: 9 v 3 (vary numbers according to number of players but 3:1ratio in favour of outside players). Extensions: development into multiple passing routines.Examples shown but list is endless and allows coach to create. Players receive ball and then move out to side and execute turns groupoo have been working on.Variations and combinations endless.Vary turns ,add in stepovers,other change of direction etc. 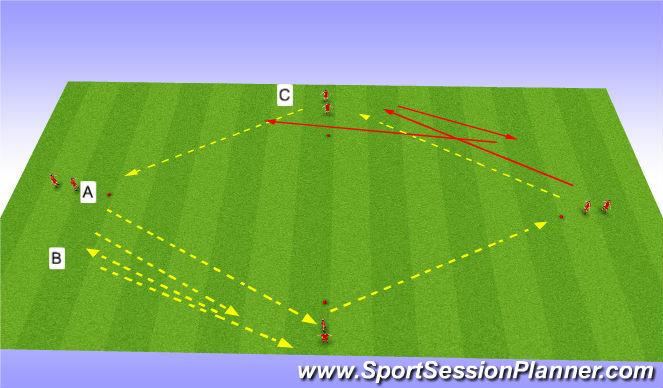 A ) Passing to next player,receive on back foot and play around circle.Players to follow pass to next cone. B) Play and receive return pass then play again to player who takes on back foot as before. C) As B but final pass played in front of cone in advance of player. 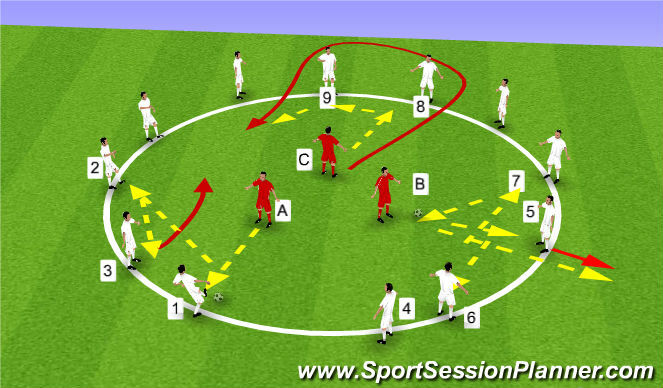 D) Players to repeat but opposite way around circle so that players are using both feet in practice. Angle and body shape to receive. Movement to create angles for 1-2. Two gates at each end.Players score by dribbling ball through either gate A or B for yellows and C or D for reds.Encourage switching when pathway to one gate closed off. Development:Yellows attack gates C or B and Reds attack A or D.